Andrea Dovizioso said that a mistake whilst riding over the limit was the cause of his crash in Barcelona. 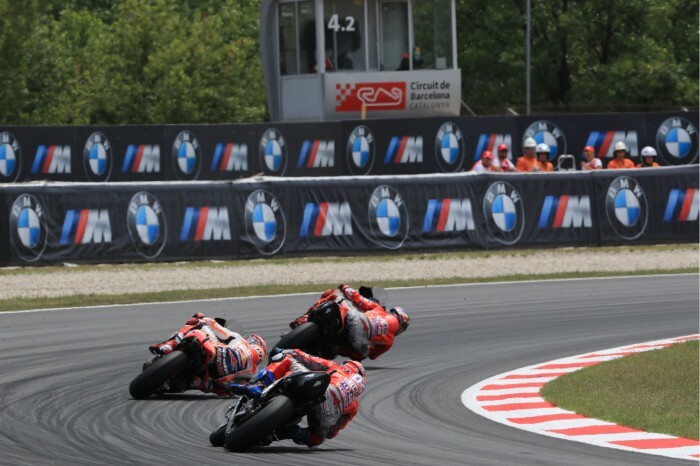 The Italian rider lost the front end at turn five and crashed out whilst trying to stay with the leading duo of Jorge Lorenzo and Marc Marquez. Dovizioso was quick to quash the idea that he was chasing Lorenzo and that is why he crashed out. “It was not about Jorge, it’s about that I want to win the race,” said Dovizioso. “I had good speed and we have to gain the points to Marc. Marc was there. So I was pushing. I didn’t want to give up. “My speed in the race wasn’t good enough. I was losing one, almost two-tenths a lap. But when the grip is very low, one or two tenths can be like one-second. So I was pushing too much. This is what happened and we go home with zero points. “In a positive way, I think there is a few things we can improve in the race, more than in the practice. We have a chance to improve the bike and I have a chance to have the situation under control,” he added. Sunday’s crash marked the third time in just seven races that he has failed to finish the race. Despite three crashes in four races, Dovi said that he confidence wasn’t knocked, as he knows what has caused all the crashes. “What happened in Le Mans and here, I know what happened. It didn’t happen in a strange way where I don’t know what’s happened, so this is positive,” he said. Dovizioso believes that a lot of Lorenzo’s success came to how he rode his bike and how specifically he brakes in a straight line. “Here I believe after the race those who broke in a slide, it didn’t work. If you look Jorge, he breaks completely straight,” he said. With his third DNF, Dovizioso now finds himself 49 points behind Marquez. Despite this, he said he would continue to ride with the championship in mind as he always does. “My approach is always thinking about the championship. If I fight for the championship or for another position, I always race for the championship,” said Dovi. “For me it’s not good and stupid, especially with this tyre, to think about just the race and make crazy things to try to get the result every race. So also if I have 49 points to Marc, always I will race for the championship. “A lot of riders are in front of me and Marc is very consistent and fast everywhere. But I don’t think that’s the reality because every race, everything can happen.